Saturday is the annual RC Cola and MoonPie Festival in Bell Buckle, Tennessee. It’s like a lot of small-town festivals. There’ll be live music and crafts and a 10-mile run. I’m guessing the race is for people who don’t eat a lot of MoonPies. There are contests, too, like a watermelon seed-spitting contest and a hog-calling contest. Anyone can enter. Last year, our daughter gave it a try. She’s not a city girl, but she’s definitely suburban. She did OK spitting a watermelon seed, but she wasn’t much at hog calling. You’re supposed to yell, “Sooo-EEEEEEEEY!” She went, “Sooey?” like she’s trying coax a kitten out from under a bed. But all that’s just a prelude to the main event, the thing that makes the festival worth the 1-hour drive from Franklin: the serving of the World’s Largest MoonPie (see above). If you’ve never had a MoonPie, it’s a graham cookie-and-marshmallow sandwich dipped in chocolate or some other flavor. They’re usually 3 inches across. 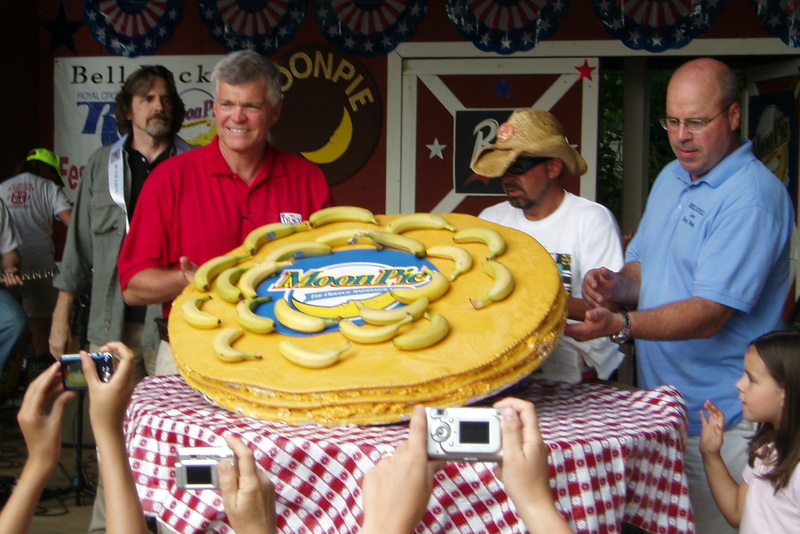 The World’s Largest MoonPie is 3 feet across, probably closer to 4, and it’s 5 inches thick. It arrives at the festival bandstand on the roof of a golf cart. If it’s sunny, it’ll be warm and gooey. If it’s cloudy, it’ll just be gooey. It’s better warm, but it’s OK just gooey. It’s sliced and served by local dignitaries. Each piece is about the size of a silver dollar (kids, ask your parents), but it’s so rich, you probably couldn’t stomach a bigger piece if you tried. You wash it down with a cold RC, which may be the only time all year you’ll have one. As the T-shirts say, it’s a Southern thing. The story goes that a salesman from the Chattanooga Bakery was talking to a group of Appalachian coal miners back in 1917, and they asked for something filling, because they didn’t always get to break for lunch. Back in Chattanooga, the salesman saw some workers dipping graham cookies in marshmallow. Someone decided to make it into a sandwich and dunked the thing in chocolate. By the 1930s, an RC Cola and a MoonPie were known as the working man’s lunch, which says a lot about the state of the Southern diet. I don’t know how Bell Buckle (population 391, according to Wikipedia) ended up with the MoonPie festival. Bell Buckle is a pretty little Mayberry of a town, though. We always have a great time at the MoonPie festival, so I’m not going to worry about it. I remember so many hot summer days in Florida in which I would hop on my dirt bike and pedal down to the 7-11 to get a moon pie and a coke. Man, those were good days. i used to live down the road from bell buckle, and went to the moonpie festival every summer. i’d ride my bike there some years. it really is a whole lot of fun. they begin the festival in the morning with a great 10k run (a little hilly and usually pretty warm), and i always enjoyed downing a cold rc after the race — and watching the cloggers and buckdancers. there’s also a moonpie-throwing contest (anyone entering, please note that a wadded up moonpie generally travels farther than one tossed like a frisbee). thanks, todd, for reminding me just a bit of the southern united states. i miss my home dearly, and won’t be able to visit until august 2011. *for anyone going to the festival, who’s never had the opportunity to try a fried moonpie, this’ll be your chance. you can get a fried snickers as well. heck, they’ll fry anything if you ask…. Glad you mentioned the cloggers and buckdancers! I get tired just watching them. I haven’t had a moon pie in years but when we were kids, we’d pop them in the microwave for a few seconds. It is so good with a scoop of ice cream in the microwave 30 seconds ready to eat. That looks delicious. Years ago, I probably would have been able to eat that in one setting, but now I would need to split it up into multiple meals. Sometimes they’re hard to find around here, but I try to pick some up when I’m out at the Cracker Barrel. We’re gearing up here in Kentucky for the Fancy Farm picnic — but this moon pie dealie sound like so much more fun! I never went to Fancy Farm. I’m not sure how that happened. If you go, though, enjoy the barbecue! Kentucky also has the Big Apple Pie Festival. Let me tell you, that pie is HUGE! My favorite scene in The Green Mile with Tom Hanks is when Wild Bill Wharton shoots a moon pie out of his mouth, all over the prison guard. OK. You’ve got me. I know the Kentucky Apple Festival in Paintsville, but I don’t know the Apple Pie Festival. When and where? we are different but that just makes us have more of that southern charm! Someone might disagree with me, but I always thought RC tasted a little like Diet Coke. I hadn’t had one in years until we went to our first MoonPie festival a few years ago. You need to drink one like coke but better. mmmm… I want a moon pie and an RC right now! I might have to stop on the way home and see if the gas station has them! Oh, I know all about them RC Colas and moon pies. I grew up in the south myself and spent many a happy hour at Folly Beach in Charleston, SC with just such junk food entrees. Charleston’s a nice place. You gotta love that Lowcountry cuisine. I love the South, and I absolutely love these kinda of weird festivals. THE MERLE FEST IS THE BEST. Banana moon pies and Delaware punch … yum! how have i lived in the south all my life and never known that a festival exists for my two favorite snacks? love. it. It’s a great little festival. You’d have a great time. Glad you like it here (and hope you fared well in the flood)! I can’t believe I hadn’t heard of the Fainting Goat Festival. Only in Tennessee…. I LOVE chocolate MoonPies! I’m not a big fan of RC Cola though. The MoonPie Festival sounds like fun, and now I’m craving a chocolate MoonPie. How’s the real estate in Belt Buckle??? I think I want to live there. I’ve never eaten a moonpie. The only time I’ve ever heard of one was in the movie “The Green Mile.” Sounds an awful lot like a creative take on the S’more. But something about the reverant tone of your blog makes me want to not cheapen the moonpie experience by going to the Seven-Eleven and buying one. I think I’ll wait until I can get down to Belt Buckle, Tennessee, and can revel in the REAL giant moonpie/RC Cola experience. It’s now on my bucket list. Thanks for the post! I WILL NEVER FORGET BILLY THE KID AND THE MOONPIE. RC COLA, BANANA MOONPIE , and a river bank “fishin” pole is afternoon of fun! ITS A SOUTHERN “THANG” GOTTA LOVE THE SOUTH. That takes me back to the days of barning tobacco in NC. Of course for us it was Moon Pie and a Pepsi! I hadn’t had an RC until we moved to Tennessee and went to the Moon-Pie festival. In fact, that’s the only time I’ll drink one. You’ve got to love RC Cola and a moonpie. Although I enjoy Coke… it’s hard to beat the price of RC Cola in a convenience store, so usually I go for that. Our “Moon Pies” in Canada are called “Wagon Wheels.” Sadly, they’ve gotten a lot smaller than they used to be when we were kids!